This Vanilla Butter Cake is my go to when making birthday cakes for my kids! When I was growing up my Mum used to make a Butter Cake each year for our birthday and it’s a tradition I’ve continued with my own kids. 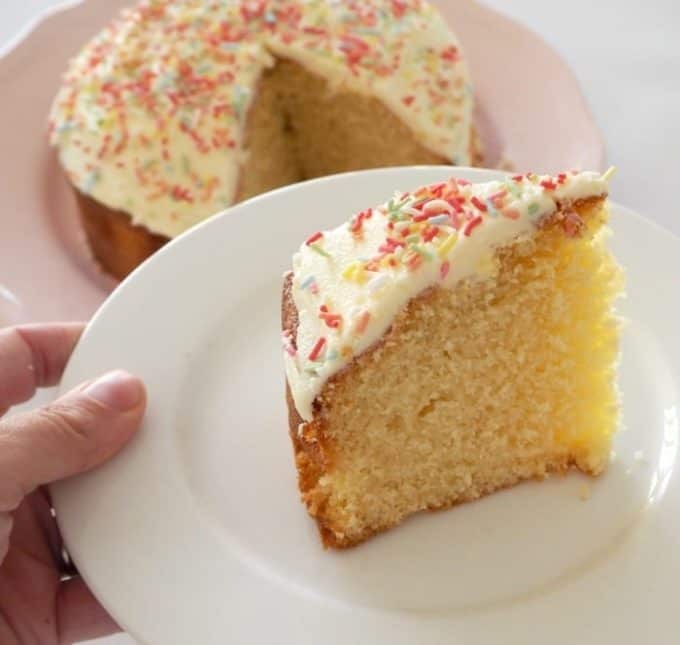 This Vanilla Butter Cake is my ‘go to’ recipe when it comes to my kids birthday cakes, as it’s truly so simple to make and can easily be doubled or even halved if I need to make a bigger or smaller cake. This cake is light and fluffy and is irresistable when eaten while still warm. 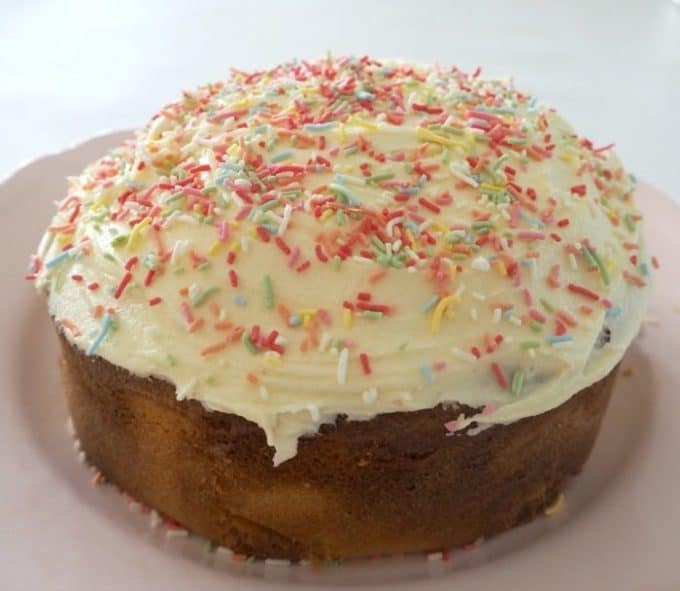 However what makes the Vanilla Butter Cake really amazing, is covering it with a thick layer of buttercream icing, this just takes me straight back to my childhood. I’ve made this Butter Cake using all types of tins and cake moulds and it turns out perfectly every single time. 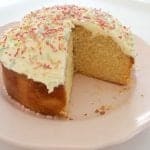 If you are using a tin different to the one specified in this recipe, just make sure you keep a close eye on your Vanilla Butter Cake as the cooking time will vary. 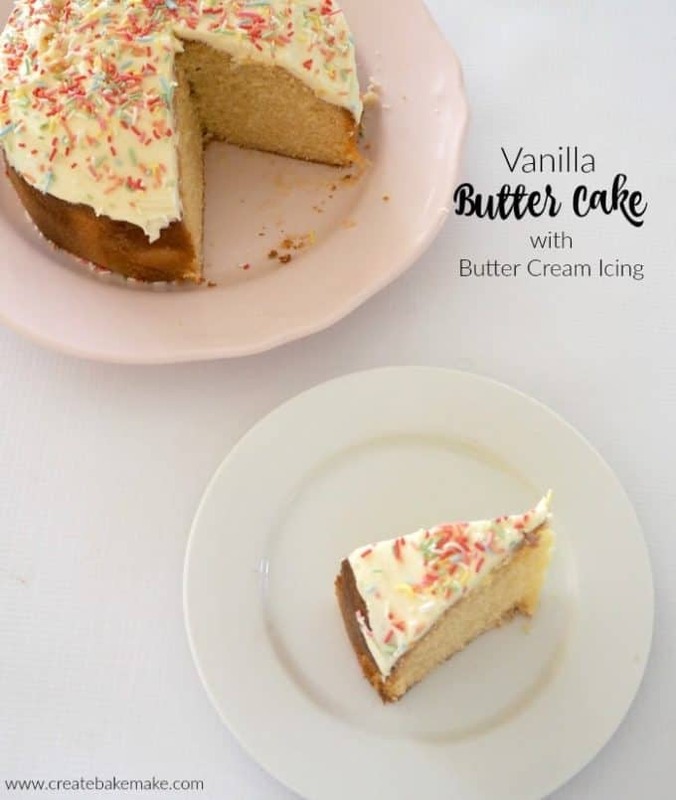 This easy Vanilla Butter Cake with Buttercream icing is the perfect cake to make for your next birthday party, special occasion or just because you feel like a piece of cake! It's freezer friendly, can be doubled or halved and Thermomix instructions are also included. Preheat your oven to 180 degrees and line the base of a 20cm non stick cake tin with baking paper. Sift the flour and salt into a small bowl and set aside until needed. Using an electric mixer, cream the butter and sugar until pale and fluffy. Gradually add the vanilla extract and combine. Add the eggs one at a time, making sure the each egg is combined before adding the next. Remove bowl from mixer stand and fold the flour and milk alternatively into the creamed mixture. Spoon the mixture into your cake tin and gently smooth the top. Bake for 35 minutes or until the cake is golden on top and cooked through. Leave cake in the tin for 10 minutes, before carefully turning out onto a wire rack to cool completely. To make the buttercream, sift the icing sugar into a small bowl and set aside until needed. Spread the buttercream over the top of the cake and decorate as desired. Place the butter and caster sugar into your Thermomix bowl and mix for 30 seconds on speed 5. Scrape down the sides and mix on speed 4 for a further 20 seconds until it’s pale and creamy. Add the eggs and 100g of the self raising flour and mix for 10 seconds on speed 4. Scrape down the sides and add the remaining ingredients and mix for 10 seconds on speed 4 or until your mixture is smooth and creamy. Pour the mixture into your prepared cake tin and place in the oven to bake for 35 minutes or until the cake is cooked through when tested with a skewer. Carefully remove the cake from the oven and let it cool in the tin for 10 minutes before transferring to a wire rack to cool completely. Place the butter and icing sugar into the bowl of your Thermomix and mix for 2 minutes on speed 3. Scrape down the sides and mix for a further 1 minute on speed 3. Scrape down the sides of your Thermomix bowl and add the vanilla extract and milk before mixing for 1 minute on speed 3. Spread the buttercream over your cake which has been completely cooled. 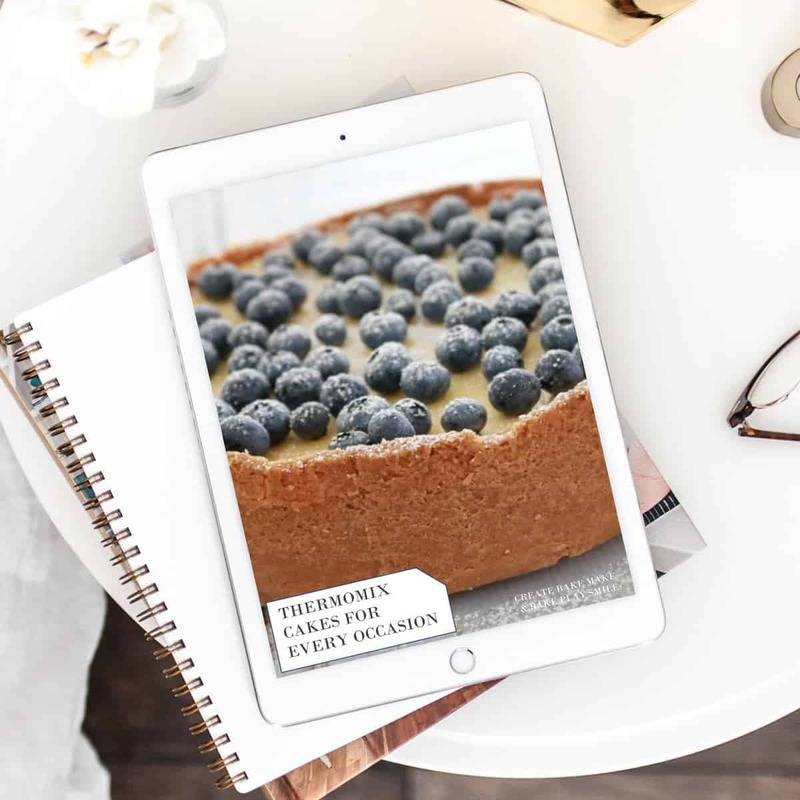 For more great Cake recipes, check out our Cakes and Cheesecakes for All Occassions eBook – Also available in a Thermomix version.